As the weather is getting cold, I was craving for something spicy. Hence I cooked this Andhra style chicken curry, this weekend. I got this Kodi Kura recipe from one of our family friend. I had tasted this once at her home, I liked it so much that I had got the recipe from her then. But I tried it only now and the gravy came out really well. In the recipe she had given around 2 or more teaspoons of chilli powder, but I reduced it to 1 1/2 teaspoons. That is the only adjustment I made. This Kodi Kura is so flavorful, spicy and delicious that it is sure to tickle your taste buds. 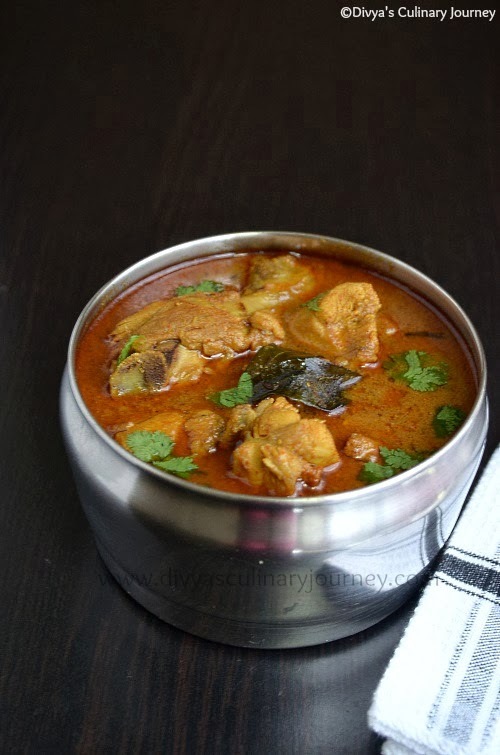 Spicy and flavorful Andhra style chicken curry. 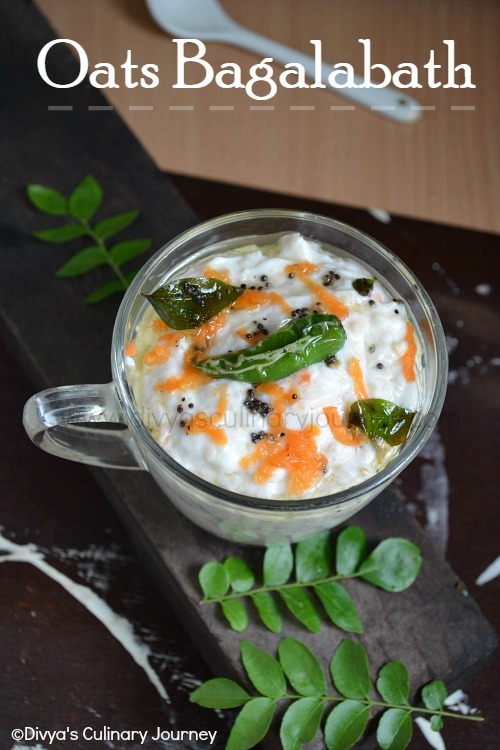 This can be served with rice, dosa, chappatti or parotta. How to make Kodi Kura? Clean and wash the chicken and cut them into required size pieces. Then to them add the turmeric powder, chilli powder, ginger garlic paste and required salt and mix well and set them aside for atleast 30 minutes. Puree the tomatoes and set them aside. Grind the ingredients listed under 'for home made masala powder' into fine powder and set them aside. In a pan, heat oil. Add cumin seeds, star anise and fry for a minute. Then add the finely chopped onions and curry leaves and fry till the onions turn translucent. Then add the pureed tomatoes, ginger garlic paste and fry for 2-3 minutes. Then add the marinated chicken, coriander powder, homemade masala powder and mix well and cook for another 2-3 minutes..
Then add a cup of water and adjust the salt as required. Mix well and cover and cook it for atleast 10 minutes in medium flame. Then check the consistency of the gravy and let it simmer in low flame till the oil starts separating. Then turn off the heat and garnish with cilantro leaves and serve. Serve it with rice, roti or dosa. This gravy is suppose to be spicy. But adjust the chilli powder as per your requirement. Marinate the chicken for at least 30 minutes. The more time the better. The chicken while cooking lets out water. So adding one cup will be enough for the gravy.If needed, add 1/2 cup more water. Cook in low flame till the oil starts seperating. Do not turn off the heat before that. This can be cooked in pressure cooker too. 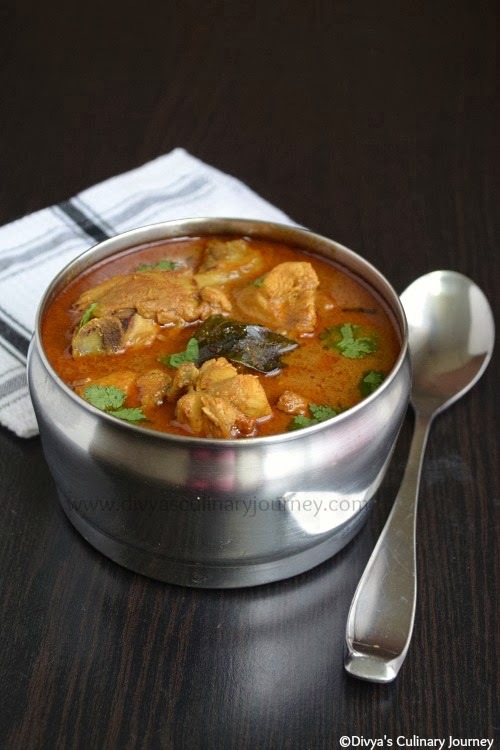 chicken curry looks so spicy and inviting...excellent recipe will try it for sure, lovely clicks da! 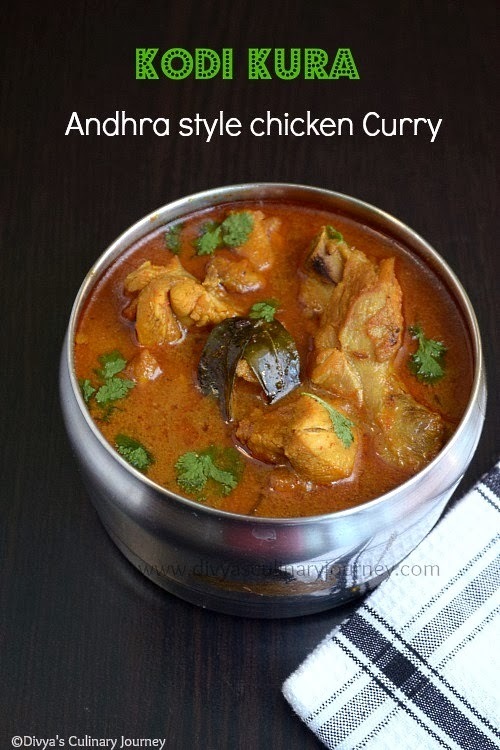 Delicious chicken curry. So well prepared. What a great looking chicken curry! And I bet it's delicious too! Wow! Looks spicy and tasty chicken curry! it looks so good.so tempting. Wow this looks great! I love all the flavors going on here! My family will love this. This looks really tasty - and I agree a little spice as the weather cools down! I am always looking for new curries and need to use up my spices. I can't wait to try this one. I LOVE this! This chicken looks outstanding! This is packed with flavors and perfect for cold winter days! This is so tempting! I'm trying to baby step my husband into curry dishes. He's been ok with a milder form. Now It's time to try this spicy one! It's looks fantastic!